URBANA, Ill. - Today’s crop breeders are trying to boost yields while preparing crops to withstand severe weather and changing climates. To succeed, they must locate genes for high-yielding, hardy traits in crop plants’ DNA. A robot developed by the University of Illinois to find these proverbial needles in the haystack was recognized by the best systems paper award at Robotics: Science and Systems, the preeminent robotics conference held last week in Pittsburgh. Crop breeders run massive experiments comparing thousands of different cultivars, or varieties, of crops over hundreds of acres and measure key traits, like plant emergence or height, by hand. The task is expensive, time-consuming, inaccurate, and ultimately inadequate—a team can only manually measure a fraction of plants in a field. 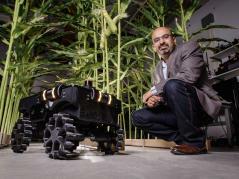 Illinois’ 13-inch wide, 24-pound TerraSentia robot is transportable, compact and autonomous. It captures each plant from top to bottom using a suite of sensors (cameras), algorithms, and deep learning. Using a transfer learning method, the researchers taught TerraSentia to count corn plants with just 300 images, as reported (DOI: 10.1002/rob.21794) at this conference. This work was supported by the Advanced Research Project Agency-Energy (ARPA-E) as part of the TERRA-MEPP project at the Carl R. Woese Institute for Genomic Biology. The robot is now available through the start-up company, EarthSense, Inc. which is equipping the robot with advanced autonomy and plant analytics capabilities. TERRA-MEPP is a research project that is developing a low-cost phenotyping robot to identify top-performing crops led by the University of Illinois in partnership with Cornell University and Signetron Inc. with support from the Advanced Research Projects Agency-Energy (ARPA-E). Photos are available online at https://flic.kr/s/aHsmnpsRCd. Additional photos and videos are available by request.